At least 10 crew members died and 10 further were missing after two ships caught fire in the Kerch Strait near Crimea, Russia's Transport Ministry said on Tuesday. 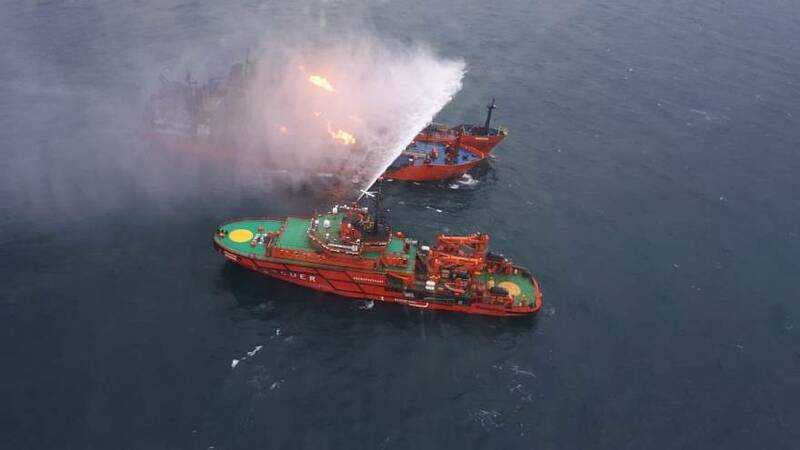 Some 12 people were rescued from the burning ship but a spokesperson for the ministry said there is little hope of finding any other survivors. The fire was sparked by the transfer of fuel from one vessel to another, according to Reuters, citing the Russian ministry. Both ships were sailing under Tanzania's flag and had a combined crew of 32 people. The operation has switched from a rescue mission to a search for bodies, said the spokesperson. Last year the two ships, known as the Maestro and the Venice, were included in a US sanctions advisory because they delivered fuel to Syria. Ships regularly go to Temryuk port, in Russia's southern region of Krasnodar, to stock up on liquified petroleum gas from Russia and Kazakhstan, which is then transferred onto tankers for export through the Kerch Strait. The strait, located between Russian-annexed Crimea and southern Russia, controls access from the Black Sea to the Azov Sea, which has Ukrainian and Russian ports. In November 2018, Russia captured three Ukrainian navy vessels and detained their crews, which sparked tensions between the two countries.